= “Maggie sensei” nante kiita koto naiyo. = I have never heard of “Maggie sensei”. We have the cutest guest teacher, ミツ先生 ( = Mitsu Sensei). Isn’t he sweet??? He will teach you how to use なんて ( = nante) today. Note: We sometimes add だ ( = da) in front of なんて ( = nante) when we quote what we have heard or emphasize our feelings even more. 1) When you emphasize the word or sentence which comes before なんて（ = nante) and express your feelings such as surprise (either positive or negative), disgust, admiration, happiness, disbelief, etc.Let’s compare the following sentences. Note : 1-b) emphasizes “exams” and shows stronger emotion towards exams. = I can’t write kanji. = There is no way that I can write kanji. = Kare no koto wo wasureru koto wa dekinai. = I can’t forget about him. = Kare no koto wo wasureru nante koto wa dekinai. = There is no way that I can forget about him. =Juken benkyou nante nakereba iinoni. = I wish we didn’t have to study for an entrance examination. = There is no way that I am having an affair. = I don’t need money at all. = Tsukiatte iru hito nante dare mo inaiyo. = I am not seeing anybody! = Meron ga ikko yonsen en（mo suru ) nante takasugiru. = A 4,000 yen melon is way too expensive. = Nichiyoubi ni shigoto nante shitakunai. = I don’t want to work on Sunday. = Mou koi nante shinai. = I had enough with love. 2) When you look down, belittle someone or something or lack of confidence. = Nihongo nante kantan da. = Japanese is just easy! = Guchi nante kikitaku mo nai.= I don’t want to hear you complaining. = AKB no kyoku nante utawanai. = There is no way that I would sing AKB’s songs. = Sumo is just boring. = Watashi no koto nante doudemo iinone. = You don’t care about me, do you? = Oniichan nante mou shiranai! I don’t care about you anymore! / I don’t want to talk to you anymore! / I have had it with you, brother. = Kare niwa watashi nante fusawashiku arimasen. = I don’t deserve him. 〜なんて can be used in both positive and negative meaning depending on the context. = Eh? Okinawa ni gokai mo itta no? Watashi nante mada ichido mo itta koto naiyo. = What? You have been to Okinawa five times already? I have never been there. = Eh? Okinawa ni itta koto naino? Watashi nante mou gokai mo ittayo. = What? You have never been to Okinawa? I have been there five times already. = You know my boyfriend has been very aloof lately. = Watashi no kare nante mechamecha yasashii yo. = But MY boyfriend is very sweet. = Watashi no kare itsumo deeto ni chikoku shitekurundayo. = You know my boyfriend is always late for the date. = Watashi no kare nante motto hidoiyo. = Well, my boyfriend is even worse..
Pay attention to what comes before and after なんて ( =nante) to see if it is used in a positive meaning or negative meaning. = Nihon ni hitori de iku nante sugoine. = It is great that you are going Japan by yourself. = Nihon ni hitori de itta nante douka shiteiru. = You are nuts going to Japan by yourself. = Inu ga nihongo wo oshieteiru nante shinjiraremasen. = I can’t believe that a dog is teaching Japanese. = Kare ga anna koto wo suru nante shinjirarenai. = I can’t believe he did such a thing. = Nihongo nouryoku shiken no Ikyuu ni ukatta nante sugoine. = It is great that you passed the level one of the Japanese Proficiency Exam. = Sonna koto wo iunante hidoi. = That’s a horrible thing to say. Basically you can replace なんて ( = nante) with なんか ( = nanka) when it comes after a noun and when you want to emphasize the word showing your strong emotion or belittle someone/something. However, you can’t replace なんて ( = nante) with なんか ( = nanka) when it comes after a verb or an adjective. Special note : Maggie Sensei once made a lesson : 「~もんか」「~もんだ」「~(だ)なんて」(~monka/=monda/~(da)nante) so please check the lesson. We sometimes leave the sentence unfinished with なんて ( = nante) letting the listener read between the lines. = Mada rokugatsu nanoni taifuu ga kuru nante. = Ima furenchi burudoggu ga ninki ga arunante koto wo kikimashita ga hontou desuka? = I heard something like French Bulldog is very popular now but is it true? = I have never heard of Maggie sensei. = Maggie sensei nante sensei wa kiita koto naiyo. = I have never heard of a teacher such as Maggie Sensei. = Ojousan nante yobareru to tereru naa. = I am embarrassed/flattered when you (or someone) address me “a young lady”. = Otagai ni iega konna ni chikai nante shiranakatta. =We didn’t know we live this close. = Shukudai wa itsumo tomodachi ni yatte morau nante hito ga imasu ga jibun de yatte kudasai. = There are people who always ask their friends to do their homework but you should do it yourself. = Kugatsu ni nattara suzushiku narunante terebi de itte ita ga shinjirarenai. = I heard something like it will be cooler in September on TV but it is hard to believe. = Nante tsumranai hon nandarou. = What a boring book it is. = Nante tabekata wo surun desu ka! = You are such a messy eater! = Kare wa nante uta ga umain darou! = He is such a great singer. = Nante utsukushii inu nan deshou. = What a beautiful dog! = Nante subarashii sensei nandeshou! = What a great teacher! = Saisho ni atta toki nante kawaii onnanoko nan darou to omoimashita. = When I first saw her (you) I thought what a lovely girl she was. = Ano hito nante (iu) namae datta? = What was the name of that person again? = Kore nante (iu) hana? = What is the name of this flower? = What did you just say? = Kono kanji nante yomuno? = How do you read this kanji? = Kodomo no koro nante yobarete itano? = How were you called when you were a child? = How did people call you when you were a child? After saying something and tell the listener it was a joke. = Ashita kara Maggie sensei no saito wa kaiin sei ni narimasu. Nantene. = As of tomorrow, Maggie Sensei’s site will be only for members. Just kidding! = Mitsu sensei Watashi no koto nante zenzen shiranainone. = Too bad that Mitsu sensei doesn’t know about me at all. I don’t get why, as 奪い返す in this form simply mean “to get back” or “steal back”. I don’t get where the “no way” come from. Could this be due to なんて? You sometimes leave the sentence unfinished with なんて to express one’s emotions. Hi Maggie sensei, thank you so much for this really useful lesson!! I have one question: in the lesson you used 彼が私のことを好きだなんて, but why is there the を particle when the verb is だ/です? が is more common with 好き but since there is already が after 彼　（彼が）, you tend to avoid the same particle が　and use を to make it sound more natural. Nante tabekata wo surun desu ka! Kare wa nante uta ga umain darou! Nante utsukushii inu nan deshou. Saisho ni atta toki nante kawaii onnanoko nan darou to omoimashita. What’s the rule about the verb? Should I always use “darou/deshou”? Nante tabekata wo surun desu! Kare wa nante uta ga umain desu! Saisho ni atta toki nante kawaii onnanoko nan desu to omoimashita. Thank you for your patience, Maggie sensei. →(more casual) Nante hito darou! →(more casual) Nante hito da! X Nante tsumranai hon desu. X Nante tabekata wo surun desu! X Kare wa nante uta ga umain desu! X Nante utsukushii inu desu. X Nante subarashii sensei desu! X Saisho ni atta toki nante kawaii onnanoko nan desu to omoimashita. Thanks Maggie Sensei! Your website is the best Japanese learning website! I thought it might be something like “I don’t know how I’m saying this but…”. It’s the は in the middle that throws me off. I was wondering how you’d translate this. I have a question about a phrase I’ve seen some times… “x shiyou ka na… nante”. Based on context I’d assume it’s somewhat along the lines of “I guess maybe I should give x a try or something” or “I’ll try x, I guess”, but I don’t entirely get how the “nante” at the end works here. Is it thrown on to make the the statement even more noncommittal than the “ka na” already made it? Is it thrown on to make the the statement even more noncommittal than the “ka na” already made it? Exactly!! And your translation is right. By adding ”…なんて(ね）” at the end, you can make your speech make sound less serious. It could also add the nuance, “I am just kidding”/ “Haha”. Oh, so using “nante” like this is the same as using “nante ne”? I always just see “nante” on its own in this particular construct. Saying “hajimeyou ka na… nante” would have roughly the same meaning as saying “I guess I should start… or something” in English, then? All these are the same group. You use them when you avoid sounding too assertive and add “vaguity”. So as you said, “or something” or ” I guess I am going to give it a try..” is very close to the nuance. Does They Have Any Relations With (Nante/Nanka)? Hmmm what could it be??? Maybe you heard the word なんぞ (Nanzo)? Sou Desu Ka, Used As (Nante/Nanka), So As A Result, (Nanzo) Has Nothing To Do With (Etc…), I Mean Like The (Toka) Word? It is possible to use なんぞ in the meaning of “,etc.” instead of など but it is old fashioned. And you have to be careful when you use it because as I mentioned in my previous comment, it has a function to belittle what you are talking about. There is no way to find it(or someone) just in 15 seconds? Hey, I just coincidentally found your blog by googling while trying to find out what “なーんてな” means. I heard that in an anime, where one particular character likes to fool people by playing dead and afterwards says “なーんてな, 死んだふり”, and since I heard that I’m trying to find a proper translation to that “なーんてな”-part but I just can’t find one no matter what I try – Google Translate obviously didn’t give me anything. Do you maybe know how to translate that word? Nothing comes before it, the entire sentence is only those 2 words. Good day to you, Maggie-sensei! I was reading this and noticed that most of the time なんて would replace は or other particles, but what if なんて comes after particles? Would that means that the なんて is emphasizing on 綺麗, or is it actually 見せ掛け? I am confused as how I should go for this… I asked various friends and they’re giving different answers for it >_< I wonder if it would be "Such a sickening world because the fakes are so beautiful" or "Such a sickening world because the beauties are so fake"? Thank you in advance. I hope you'll have a good day! People give you different answers because there are two possibilities. ２）It modifies 綺麗 and 吐き気がする Such a “beautiful and sickening” world. How is なんてused in this context? Does it mean “Mom says that it is a lot easier and better to prepare meals when dad is not here”, where emphasis is placed on how much easier it is to prepare meals? Does “がっているんです” mean show signs of? Do you mind explaining? If I were to say this in English a bit literally, can I say “It can be understood because whenever dad calls, mom is happy”? This なんて means “(to say something like) ~~~” but it involves some feelings of a little surprise or jokingly accusing in this case. 2) 寂しがる to feel lonely. I have がり、がる lesson. So please go check. In your examples なんて always replaces は or を after a noun. I was wondering if なんて can be used with other particles like に、で、から、まで、より、しか、し etc. and what the word order would be. Thank you for spotting the typos. You can use なんて with other particles. Hi Maggie, thanks for your great lessons. The final 「なんでしょう」 means anything in particular o is it just used to emphasize the sentence? Can you use 「なんて」　alone? = How lovely weather it is. = What an awful person he/she/they are. Though you see this expression a lot in writing, we just say いい天気だね／いい天気ですね／ひどい！／ひどい人！in real conversation. good morning dear maggie sensei and everyone. i have a question about “what a” part of the lesson. does that mean “nanka” can also substitutes “nante” in this kind of situation? nanka utsukushii inu nan deshou. なんて and なんか are different. なんか（a casual way to say 何か=nanika) means “somehow” “you can’t explain why but somehow…” “for some reason” “like”or we sometimes use it to emphasizing the word. hello! 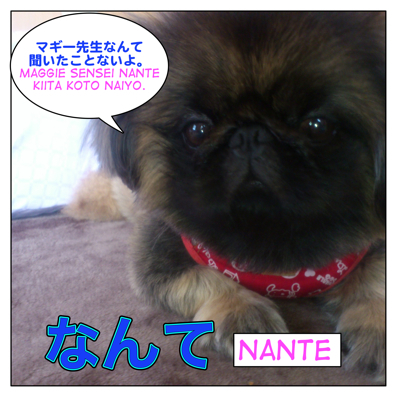 im a bit confused about when ‘nante’ is at the end of the sentence. like… after a somewhat sentence, he says, なぁんて. is that equivalent to ‘just kidding’ as well? or maybe ‘like this’. eg. watashi mo suki desu, naante. I was wondering about the word “なんか” It seems to have a very similar usage; Is it just a derivation ? If so, what nuance does it have? Thanks in advance and cheers for your EXCELLENT work ! 1) when you emphasize the word which comes before なんて（=nante) and express your feelings such as surprise (either positive or negative), disgust, admiration, happiness, disbelief, etc. But you use なんか right after a noun and　you can’t use なんか after an adjective or verb. WOW. Your contents are VERY valuable in a world of crazy books and many explanations, none of them useful at all in the real life. I am very happy to hear that! Hope you can learn something here. You can use 方 here. = Kare douyatte doryoku shinai de katte iru nodarou. mou uchi ni kaeritai desu. shigoto de iro iro atta no desu.